The more finely you chop herb leaves, more of the cut surface will be exposed and more aromatic oil is released. Herbs weaken in flavor the longer you cook them, so add them at the last minute to foods. Freshly picked and slightly crushed herbs have the best flavor. Powdered herbs are twice as strong as dried ones and eight times stronger than fresh. To keep garlic from sticking to your knife, sprinkle a few drops of water on the cloves. Garlic will stick to the cutting board and not your knife. Scrape fresh ginger with the back of a spoon. This will remove the peel and leave most of the ginger behind. Use a grapefruit spoon for best results. Work the flavors of herbs into meat, poultry, and seafood by rubbing the herbs between your palms. The warmth of your hands will release the aromatic oils. Add a pinch of ground cinnamon to tomato sauce or paste. Cinnamon brings out the natural sweetness of the tomatoes. When making apple jelly or raspberry jam, add a sprig of fresh lavender. Roasting gives garlic a mild, nutty flavor. Bake in foil at 350 for about 15 minutes. Use in sauces, purees, soups, stir fry and marinades. 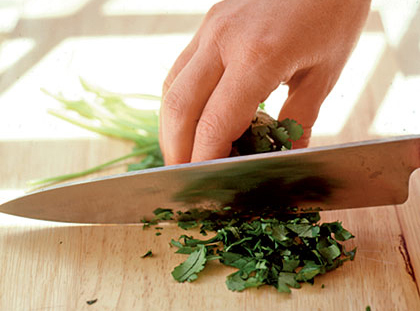 To chop fresh herbs leaves in a hurry, stuff the leaves into a glass measuring cup, insert scissors and snip away. When using fresh herbs in salad dressings, allow the flavors to mellow 30 minutes before serving. For a delicious flavor, add fresh tarragon to melted butter and pour over steamed asparagus.